Over the last 9 weeks we’ve watched the building of my new home workshop – from the initial plans and bare site, to the construction, wiring and lighting. So what’s been learned? 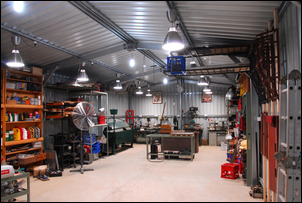 How well does the finished workshop operate? And what are the shortcomings? The key features of a home workshop have been stressed through the series, but here they are in summary. Go for the maximum wall height your budget and location allows. Every metre that you can add to the height of the walls is potentially a lot more storage space. For example, in my workshop, one extra metre of wall height equates to an extra 40 square metres of wall storage space. That’s an area greater than the entire floor space of a 6 x 6 metre shed! Sure it’s vertical and not horizontal, but it’s still a helluva lot of space to attach shelves. 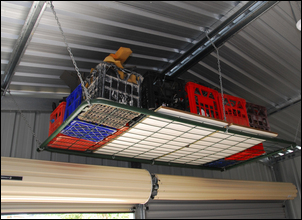 Furthermore, an extra metre of wall height results in a roof that’s a metre higher – allowing items to be stored by hanging them from the rafters. 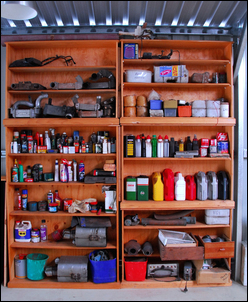 This is very useful for all manner of things – from hanging up exhausts, to storing items on high-mounted flat racks. 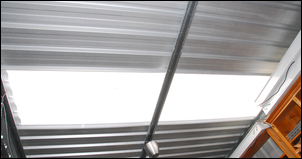 Providing lots of natural lighting (eg through windows, translucent plastic roofing sheets or skylights) has the potential to significantly reduce electric light running costs and also to a give a level of illuminance that’s hard to achieve with artificial lighting. The way in which natural lighting is to be provided needs to be decided early in the workshop planning process. Getting the electric lighting right in my workshop was a far harder ask than it initially looked. In short, to provide a level of illuminance that does not result in reduced working efficiency, you need something in the order of three to four times the amount of lighting used in typical workshops. In fact, instead of looking towards other workshops for a guide, look at the lighting used in commercial offices and shops. 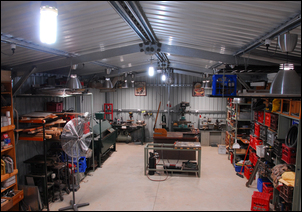 You will also probably find that the budget for lighting is much higher than it initially looks – if buying new, perhaps as much as 15 per cent of the cost of the entire workshop (and that cost doesn’t include wiring). Workshop processes like sanding, using fibreglass resin, painting and welding all need lots of ventilation. 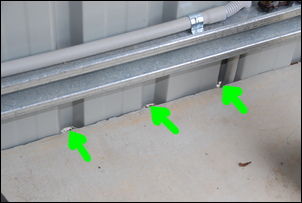 In cold climates, that ventilation may need to be activated only when necessary; in mild climates, it makes sense to have a constant through-put of air through your workspace. 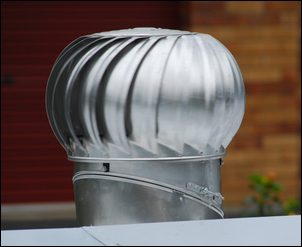 Roof-mounted ventilators, wide-opening doors, opening windows, fixed grilles, electric fans – all need to be considered. As with natural lighting, decisions about ventilation need to be made early in the planning. 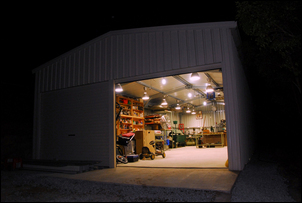 Especially in a home workshop where lots of car work will occur, having a large access opening makes things so much easier. 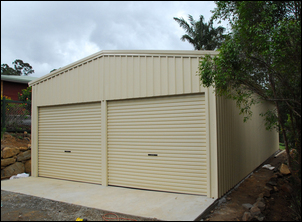 Look at build options – eg an extra-wide roller door, or two roller doors with a removable pillar sited between. And don’t forget something I did – clearance height. If you go up in wall height, it also makes sense to also increase the height of the door openings. Finally, many shed/workshop designs include a personal access door. Having previously had a shed built with a personal access door (a door I found I never used), I chose to leave it out of this design, resulting in a cost saving. So consider whether you’re happy to open the main door every time, or whether you’d like access through another smaller door. But perhaps the most important of the key features is something that is largely philosophical. In addition to spending a lot of hours on the workshop with my hands, I also spent a helluva lot of time just sitting in the space (initially, on the bare slab!) thinking-through the internal organisation of the workspace. Where to put the bench? The lathe? The storage shelves? Where to put the power points, the lights and the switchboard? 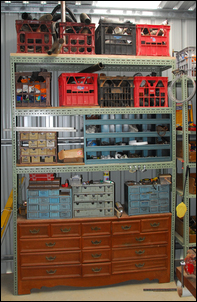 Which end of the workbench to have the vice; where to put the oxy equipment? It sounds a bit wanky, but I think that now, having finished, the ‘thinking-through’ part was the most important activity I undertook. Why? Well, when I could start actually using the workshop, things immediately fell into place. The tools were where I wanted them, the clearance between the machines and the benches were fine, the lighting bright and even, the power-points to hand. In short, I could immediately be productive and effective, because everything was where it should be. So the interior design suits me – my height (important when setting the height of working surfaces), my eyes (I like bright illumination), my habits (cleaning-up by just tossing the tools back into their open storage drawers), my interests (my first two jobs in the new workshop were installing an electronic module in my car, and building a wooden truck for my 4 year old son), and my working style (safety glasses and ear muffs within easy reach, radio playing). None of those characteristics would necessarily suit someone else (though you’d hope things like proximity of tools and open spaces between machines would be universal) but they don’t have to – it’s my workshop, built for me. For any individual, this sort of ‘personalised’ design is hugely advantageous. OK, so what don’t I like? Firstly, the concrete is not of the same quality throughout the shed. The area that after being laid was shaded – and so took a long time to go hard – has a much softer surface than the concrete elsewhere in the shed. 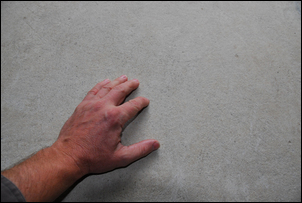 In fact, it is soft enough that dust can be raised from its surface just by hard rubbing. I assume (hope!) that once the tops of some of the small rocks are revealed, this surface will become more hard-wearing. Another problem is also with the concrete. 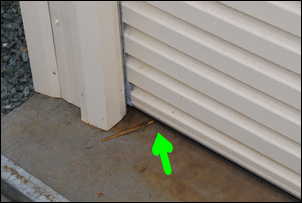 The ‘step’ placed in the floor at the entrance (designed to stop water being able to enter the workshop by being blown under the doors) does not have sufficient ‘fall’ at one end, resulting in water pooling. In short, the step has just the opposite effect from that intended! I am still undecided as to whether more translucent roof panels should have been used. I fitted two towards the ‘machinery’ end of the workshop and these provide plenty of natural light. I didn’t use more of these panels because I was concerned that they’d cause excessive heating – and on a sunny day, the end of the shed with the two panels is clearly warmer than the other end. However, how much unwanted heating these panels provide can’t really be assessed until the height of summer, which at the time of writing, it isn’t! If required, retrospective fitting of addition translucent sheets will not be difficult. I think I’ll fit a stainless steel sink and cold water tap. Until one wasn’t readily to hand, I didn’t realise how often I use water – rubbing back a part with wet-and-dry, getting a bucket of water for cooling a part that’s being ground, washing hands and cleaning parts. Including a sink should have been in the planning from day #1. Because the Colourbond wall sheets wrap over the edge of the concrete slab, there are gaps all around the base of the walls, formed by the ‘peaks’ in the sheets. Nothing is supplied in the shed kit to cover these openings. I’ve decided to leave them open, as they provide excellent intake ventilation airflow, even when the shed doors are shut. (Air is continually exiting through the wind-driven whirligig ventilators.) However, these openings are also large enough to allow entry of small vermin, so I’ll need to keep an eye on that aspect. If you’ve looked at the tools and machines shown in the workshop covered in this series and thought: “How to the hell do I get all that stuff?”, here are some answers. My sheet metal folder, bandsaw, metal shears, power hacksaw, saw bench and many other items were bought secondhand. Scour eBay ads (especially in ‘Business and Industrial’), and attend local auction houses and secondhand machinery sellers. Before spending the cash, make sure you’re aware of new prices - in most (but not all!) cases, secondhand items will be about half new price. Often a coat of paint and some grease will bring up used items to near-new condition. Machinery sellers like Hare and Forbes have annual sales where there are significant discounts. My first lathe was bought secondhand, my current lathe was bought new but on special. When someone asks you want you want for birthday or Christmas, don’t say “Dunno”. Instead say: “A really good set of metal snips.” Or: “A screwdriver set.” Or: “A high-lift trolley jack.” My bi-metal hole-saws were a gift: I didn’t ever consider it worthwhile shelling-out their purchase price – but since receiving them, I have used them literally hundreds of times. When I built my workbench in about 1988 I would have been staggered if someone had told me that 20 years later, I’d still be using it. (And that it would follow me across two states and five houses!) But machinery and benches don’t really wear out – not in home workshop use, anyway. So a lathe might cost $2500, but if you use it for the next 20 or 30 years, the overall cost per year is trivial. Especially if you’re young, it’s kinda hard to think that way, but when weighing-up the costs and benefits of buying machines and equipment, remember that some items are effectively forever. Perhaps one of the greatest surprises is in how much money is able to be saved by getting lots of quotes from different tradespeople and suppliers, sourcing your own new and secondhand parts, and doing as much as possible yourself. I saved about $10,000 by doing these things. Talking to the local planning authority is also important – on the basis of the current planning procedures, my workshop would not have been given planning permission. However, in phone discussion with the planners, it arose that I could apply under a superseded planning act – and then the shed size was fine. And finally, as I have stressed in this story, thinking-through the workshop layout and organisation so that it suits you - and what you will be doing in the workshop - is the main key to success.